Options menu is automatically opened, this happens if there aren't any saves done yet. Game says it autosaves when feather icon is displayed, but in reality it saves only sometimes when feather icon is displayed which may result save loss as there aren't manual saving. 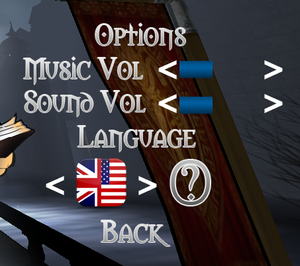 No options outside volume and language, even resolution changing requires specific conditions and are limited to arbitrary values. Steam popup to select resolution. 1280x720, optionally 1400x1050, 1440x900 or 1600x900 but only if matches desktop resolution and alternative executable is used. Keys told in how to play accessed on question mark at options. 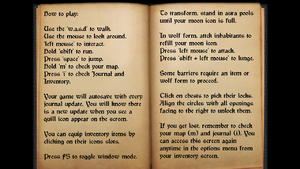 Controller keys aren't mentioned within game, they are told in manual located in <path-to-game>. No way to disable rumble even if playing with keyboard, menus are navigated by moving cursor with left stick and right stick has zero deadzone. ↑ 1.0 1.1 File/folder structure within this directory reflects the path(s) listed for Windows and/or Steam game data (use Wine regedit to access Windows registry paths). Games with Steam Cloud support may store data in ~/.steam/steam/userdata/<user-id>/259640/ in addition to or instead of this directory. The app ID (259640) may differ in some cases. Treat backslashes as forward slashes. See the glossary page for details. This page was last edited on 12 April 2018, at 06:38.